The Wire Fox Terrier (also known as Wire Hair Fox Terrier or Wirehaired Terrier) is a breed of dog, one of many terrier breeds. It is a fox terrier, and although it bears a resemblance to the Smooth Fox Terrier, they are believed to have been developed separately. The Wire Fox Terrier is a sturdy, balanced dog weighing 7.7 to 8.6 kg (17 to 19 lb) for males and 6.8 to 7.7 kg (15 to 17 lb) for females. It should not be more than 39 cm (15 1⁄2 in) at the withers. Its rough, broken coat is distinctive. Coat color consists of a predominant white base with brown markings of the face and ears, and usually a black saddle or large splotch of color; there may be other black or brown markings on the body. Two of the wire fox terrier's most distinctive traits are its energy and intelligence. It has a low threshold for boredom and requires stimulation, exercise and attention. The wire fox terrier is a companion animal that requires near-constant attention. The dog should be alert, quick and ready to respond swiftly with enthusiasm. However, they should also be friendly, communicative, and playful if they receive the proper care and exercise. Bred to be independent thinkers, they are capable of tactical maneuvering for vermin and other sport. Often, wire fox terriers are abandoned or surrendered for reasons that may include: running away instead of coming on a command; chasing cars, bicycles, other dogs, etc. ; or taunting and then attacking other animals, including a household's cats and other dogs –and they are able to do serious damage. But these are actually normal behaviors for a breed designed to hunt not only foxes, but also badgers and boars, with no more fear of cows or buses than they have of small prey. Keeping one as a pet requires firm control to redirect these prey instincts and provide the dog with enough exercise and diversion. With diligent supervision, wire fox terriers can be amusing, exciting, long-lived companion animals. As of 2019, the wire fox terrier has the distinction of having received more Best in Show titles at Westminster Kennel Club dog shows (currently 15) than any other breed. Matford Vic, a wire fox terrier, is one of only five dogs to have won the Westminster Kennel Club Dog Show on more than one occasion. She won the competition twice, in 1915 and 1916. The only dog to win it on more occasions was Warren Remedy, a smooth fox terrier, who won it on three occasions between 1907 and 1909. Archie, owned by Gill Raddings Stunt Dogs, starred in ITV's Catwalk Dogs. Beauty, awarded the Dickin Medal for conspicuous gallantry or devotion to duty while serving in military conflict. Boer, the dog of Alexei Brusilov, the author of the 'Brusilov Offensive'. Featherstonehaugh (pronounced 'Foon'), "a wire-haired fox terrier of irreproachable breeding" from Margery Allingham's novel Police at the Funeral. Pard, the companion of Humphrey Bogart character in 1941 film High Sierra. Pard was played by Humphrey Bogart's own dog, Zero. It is evident in the film that Pard loves his master. Topsy, the dog of actress Diana Napier while married to tenor Richard Tauber. Watch, the pet and companion of The Boxcar Children, is a Wire Fox Terrier. 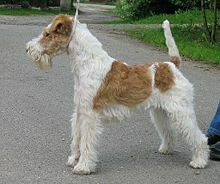 Fox Terrier, for additional details on history, genetics, coat color, etc. ^ "Wire Fox Terrier - Information, Characteristics, Facts, Names". DogBreedsList.info. Retrieved 13 February 2019. ^ "Wire Fox Terrier". United Kennel Club. 1999. Retrieved 24 June 2016. ^ "Official Standard of the Wire Fox Terrier" (PDF). American Kennel Club. February 9, 1991. Retrieved 24 June 2016. ^ "Best in Show Winners". The Westminster Kennel Club. Retrieved 2011-01-20. ^ "Best in Show Winners". The Westminster Kennel Club. Retrieved 2009-12-28. 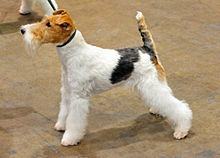 ^ Petside: Sky, a Wire Fox Terrier, Named Best in Show at the 2012 National Dog Show. Retrieved 2012-11-23. ^ Forever Foxed: Famous Fox Terriers No. 1; Thomas Hardy's Dog. Retrieved 2019-03-26. Wikimedia Commons has media related to Fox Terrier.